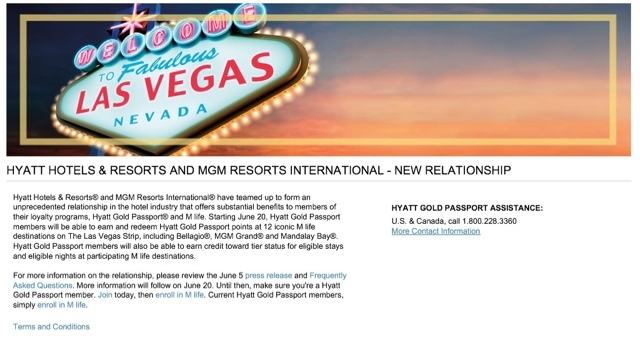 Hyatt Gold Passport and MGM M Life will be partnering up starting June 20th. You will be able to earn points with both programs and you will receive reciprocal elite benefits. Users will be able to book MGM stays directly through Hyatt.com. In order to take full advantage of this offer you must be a member of both Hyatt Gold Passport and MGM M life. The participating MGM locations in Las Vegas are: Bellagio, ARIA, Vdara, MGM Grand, The Signature at MGM Grand, Mandalay Bay, THEhotel at Mandalay Bay, The Mirage, Monte Carlo, New York-New York, Luxor and Excalibur.